Could You Be Our New Community Ranger? Erewash Borough Council has been successful in obtaining over £740,000 from the Heritage Lottery Fund to refurbish Victoria Park, Ilkeston. The Victoria Park Heritage Project has seen the complete restoration of three key features within the historic park – the bandstand, the pavilion and the pergola arch. As part of this project an exciting opportunity has arisen within the Operational Services Directorate. 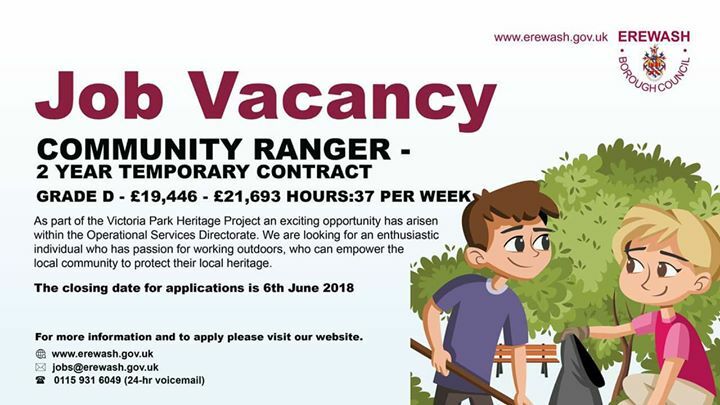 We are looking for an enthusiastic individual who has a passion for working outdoors, who can empower the local community to protect their local heritage. You must have excellent organisational skills and be an effective communicator.